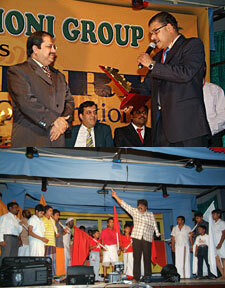 JEDDAH, 19 April 2008 — Keralite artists including schoolchildren regaled a large crowd of Indian expatriates, presenting a variety of entertainment programs at the 12th anniversary celebrations of Maithri, an organization striving for the unity of Indians. Opening the event at International Indian School auditorium on Thursday, Consul General Ausaf Sayeed commended Keralites’ efforts to promote communal harmony. He also referred to Kerala King Cheraman Perumal who undertook a journey to Makkah during the time of Prophet Muhammad (peace be upon him) and embraced Islam. Honesty and other qualities of Arab traders led by Malik bin Deenar, who visited Kerala during the Prophet’s time impressed the king and encouraged him to travel to Makkah. “Kerala has an important position in the heart of India...,” Sayeed said and praised Keralites for their unity, hard work and dedication. “Malayalam language plays a big role in uniting Keralites,” he added. The career diplomat, who is leaving Saudi Arabia shortly at the end of his tenure, noted Kerala’s role in strengthening Indo-Arab relations. Maithri’s President Raman Madhu earlier praised Sayeed’s efforts for the welfare of the Indian community and for the promotion of Saudi-Indian ties. Suhel Ajaz Khan, consul for Haj, publicity and information, was also honored during the ceremony. He will also leave the Kingdom shortly. The cultural program began with a symphony directed by Krishnan Master. Mirza Sharief, Linsi Babu, Rajni Vinod and other performers received applause for their melodious songs. Sancharam (journey), a drama, was one of the major attractions of the program. It featured a group of people traveling on a bus from Kasaragode to Trivandrum during which they witness a series of events taking place in the state. The drama directed by Anil Nooranad highlighted various social issues including the political killings in Kannur and TV channels’ exploitation of the public through reality shows. It stressed the need for unity among different religious groups. When the bus reached Kannur, the passengers saw demonstrations by different political groups, each boasting of their “martyrs.” At that time, a person who was lying on the ground got up and said that the families of the dead including their wives and children were the real “martyrs” because they were the ones who suffer when their loved ones are killed. The demonstrators then pledged that they would not kill each other. The passengers of the bus were also seen watching the Malabar Shopping Festival in Calicut and Thrissur Pooram. When they reached Kottayam, they saw Muslim and Christian leaders embracing each other following a religious procession — the aim, the drama sought to convey, was the importance of religious tolerance and amity. During the ceremony, Indian school students who won top marks in Class X CBSE exams last year were honored. George Varghese, general secretary, welcomed the guests.